Jewish Statehood (1896-1948). Published by the Education department of IDF. Tamuz 20, 1948 (July 1948). English. 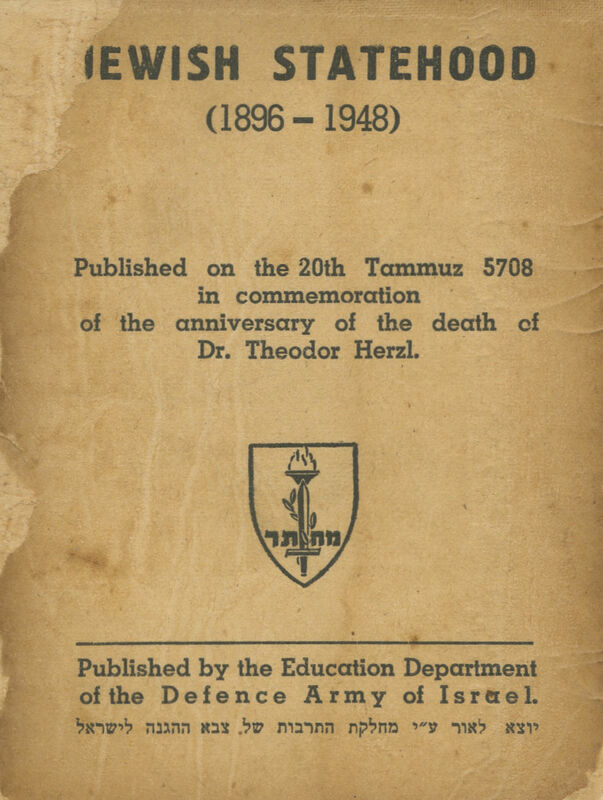 A booklet published by the education department of the IDF to commemorate the death anniversary of Theodor Herzl. The booklet includes an informative text about Herzl's book "The Jewish State", with select quotations; an informative text about the first Zionist congress in Basel, and a translation of Bialik's poem "The Zionist Delegates" which was written for the Congress; a collection of excerpts about the Jewish State by Chaim Weizmann, A.D. Gordon, David Ben- Gurion and Moshe Shertok (Sharett); and an English translation of the Declaration of Independence. 3-21,  pp, 11.5 cm. Back cover may be missing. Fair condition. Stains on all of the leaves. Small tears at margins of leaves. The leaves, which are disconnected from one another, have been placed in a new paper cover to which most of the original front paper cover has been affixed. The spines of the leaves are reinforced with thin, acid-free, paper. Not in NLI or OCLC.